On arrival pick up from Srinagar Airport rest of the day at leisure. O/N stay at Srinagar hotel. shikara ride on Dal lake. 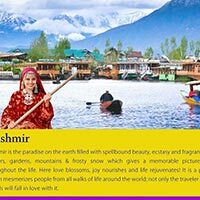 O/N stay at Srinagar Houseboat/Hotel. to Kangdori/Alpatar (at your own cost). later drive back to Srinagar. O/N stay at Sriagar. After breakfast, local sightseeing at Pahalgam. After lunch time free at leisure.O/N stay at Pahalgam. After breakfast day at leisure. You may go for walks or pony ride to one of the many beautiful spots around Pahalgam. O/N stay at Pahalgam.